This image was obtained from IMSI’s MasterClips Collection, 1895 Francisco Blvd. East, San Rafael, CA 94901-5506, USA. Use “I” statements. It sounds cliché, but focus on YOUR feelings, not the other person’s actions. Calmly explain how the person’s actions make you feel. The louder you get, the more likely the person is to feel that you are attacking them, so try not to raise your voice. Step away from the computer. E-mail is great for business purposes because it is fast and efficient. However, it can also be easily misunderstood due to the impersonal nature of the communication. If you receive an e-mail that upsets you, don’t just fire off an e-mail back. Talk to the person face-to-face to get to the bottom of the situation. Pay attention to body language. Pay attention to your posture and expression when discussing problems with a colleague. Don’t tap your feet, cross your arms or furrow your brow. All such actions indicate that you are closing yourself off and are offensive or defensive gestures indicating conflict. Try to maintain eye contact and keep your body language open by maintaining a relaxed posture with your arms to your sides. Call a time-out. If you and a colleague are talking in circles or you feel like an explosion is inevitable, take a break. A walk around the block or floor can help you organize your thoughts and calm down. Find a referee. During a disagreement, it can be difficult to hear what the other person is saying because you are busy finding fault with his or her argument or thinking about what you want to say next. 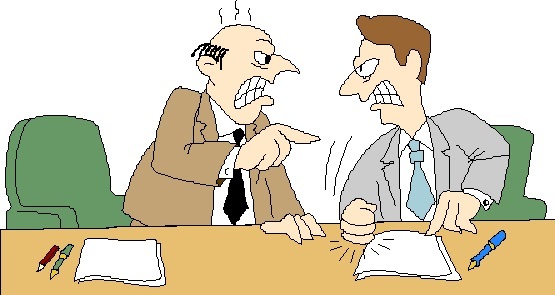 Ask a supervisor or other impartial co-worker to act as mediator. Meet in the middle. If you can’t reach an agreement on what to do, try to compromise. It doesn’t have to end with one person right and the other wrong. Previous postDoes Your Company Have a Customer Service Oriented Culture?